Position oven rack in the middle of the oven and preheat to 325º F. Put a tea kettle or large pot of water on the stove to boil for the water bath. Mix together the crust ingredients and press into 9” springform pan. You can press the crust just into the bottom, or up the sides of the pan too – baker’s choice. Set crust aside. In a large bowl, beat together the cream cheese, sugar, flour, and salt until smooth. If using a mixer, mix on low speed. Add the whole eggs and the egg yolks, one at a time, beating well (but still at low speed) after each addition. Beat in the vanilla and sour cream. Place the springfrom pan in a larger roasting pan. Fill the roasting pan with the boiling water until it reaches halfway up the sides of the cake pan. If your cheesecake pan is not leakproof, cover bottom securely with foil before adding water. Bake until the cheesecake is firm and slightly golden on top, 70 to 80 minutes. Remove the cheesecake from the water bath and cool to room temperature. Cover the cheesecake with plastic wrap and refrigerate until very cold, at least 3 hours or overnight. Strawberry Glaze: Puree frozen strawberries in a small food processor or with an immersion blender. Press blended strawberries through a fine mesh strainer in to a small saucepan. Add water. In a small bowl, mix together sugar and cornstarch. Stir into the puree in saucepan. Bring to a boil, stirring constantly. Continue cooking and stirring until thickened and clear. Add food coloring, if desired. Cool to room temperature. Arrange strawberries in a single layer around the cooled cheesecake. 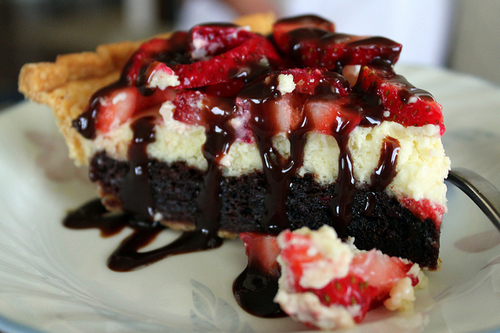 Drizzle cooled glazed evenly over strawberries on cheesecake. Store, covered, in refrigerator.